There are a total of fifty (50) small balls, twenty-one (21) medium balls and two (2) large balls available as scoring objects in the game. The field is divided down the center by an 11.5″ tall lexan wall. This wall separates the two alliances of two robots onto opposite sides of the field. 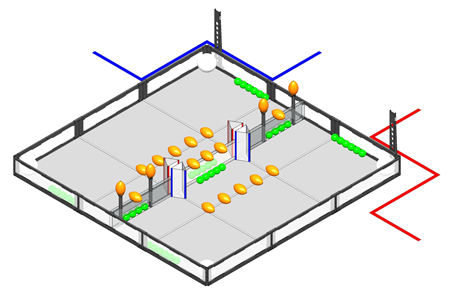 Each robot (no larger than 18″x18″x18″ to start) begins a match on their side of the field touching the wall furthest from the center wall. There are four 18″ high triangular goals attached to the wall which robots can place small balls into. There are two slots in the wall which robots can pass small balls through. At the start of the match small & medium balls are positioned on the center wall, and around the field. Each alliance will have one large ball which must be introduced to the match with less than thirty seconds remaining. 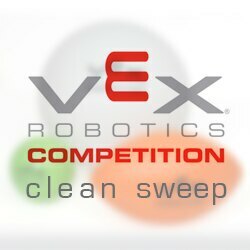 Excellence Award 394 Highlands Intermediate Robotics Team Highlands Intermediate School Hawaii, U.S.